Oberth (in front) with fellow ABMA employees. Left to right: Dr. Ernst Stuhlinger, Major General Holger Toftoy, Oberth, Dr. Wernher von Braun, and Dr. Robert Lusser. Hermann Julius Oberth (June 25, 1894 – December 28, 1989) was an Austro-Hungarian-born, German and Romanian physicist, whose writings in the 1920s sparked a surge of interest in the subject of space flight. He was among the first to write about the use of liquid propellants in rocketry. Oberth participated in the development of the German V-2 rocket during World War II, and in the American space program after the war. Oberth was the son of Dr. Julius Oberth, the head of a Saxon family in the city of Schäßburg (present-day Sighişoara), in Transylvania. On Oberth's tenth birthday, he was given a telescope, and this gift triggered some speculation on his part as to how one might travel to the moon. In high school, Oberth became fascinated with the field in which he was to make his mark through the writings of Jules Verne, especially From the Earth to the Moon and Around the Moon, re-reading them to the point of memorization. Influenced by Verne's books and ideas, Oberth constructed his first model rocket at age 14. In his youthful experiments, he arrived independently at the concept of the multistage rocket, but lacked the resources to pursue his idea on any but a theoretical level. He did, however, make calculations demonstrating that the canon that launches the characters of Jules Verne's novel into space would kill its passengers because of the high acceleration required to reach the velocity necessary to escape the earth's pull. Oberth suggested that a rocket could be used to make escape from terrestrial gravity a non-lethal event. In spite of the distractions that his investigations into rocketry created, Oberth continued his studies, and passed his final exams with accolades, graduating in 1912. Later that same year, Oberth went to Munich to study medicine, but at the outbreak of World War I he was drafted in an Imperial German infantry battalion and sent to the Eastern Front. In 1915, he was wounded, and was moved for treatment to a medical unit in his hometown. Here he initially conducted a series of experiments concerning weightlessness and later resumed his rocket designs. In 1917, he showed designs of a missile using liquid propellant with a range of 180 miles to Hermann von Stein, the Prussian Minister of War. This did not generate the interest that he had hoped, and as a result, Oberth turned to the development of peaceful uses of rocketry and space travel. On July 6, 1918, he married Mathilde Hummel, with whom he had four children, among them a son who died at the front during World War II, and a daughter who also died during the war, when a liquid oxygen plant exploded in a workplace accident in August 1944. In 1919, he moved once again to Germany, this time to study physics, initially in Munich and later in Göttingen, Heidelberg, and Klausenburg, in Transylvania. Oberth's 1922 doctoral dissertation on rocket science was at first rejected. Phillip Lenard, the Nobel laureate, felt that the work was excellent, but too interdisciplinary to qualify as a physics dissertation. Another scientist likewise praised it, but said it was unacceptable as an astronomical work. Oberth commented later that he made the deliberate choice not to write another doctoral dissertation. "I refrained from writing another one," Oberth said, "thinking to myself: 'Never mind, I will prove that I am able to become a greater scientist than some of you, even without the title of doctor.'" He criticized the German system of education, saying "Our educational system is like an automobile which has strong rear lights, brightly illuminating the past. But looking forward things are barely discernible." Oberth submitted the paper to qualify for a teaching degree, and was finally awarded with the title of doctor in physics by professor Augustin Maior, at Babeş-Bolyai University, Cluj-Napoca (Romania), on May 23, 1923. He had the 92-page thesis privately published at the end of 1923, as the controversial Die Rakete zu den Planetenräumen (By Rocket into Planetary Space). By Rocket into Planetary Space became an immensely popular work that influenced the future of rocketry and catapulted a vision of space travel into the public imagination. In this work, Oberth discusses the benefits of liquid fuel rocketry and many aspects of space flight. While somewhat technical in nature, the dissertation was later popularized and publicized by other writers, bringing almost immediate fame to Oberth, who in 1924, took a teaching position at a high school in Transylvania to support his family. Inspired by Oberth's writings, German rocket researchers and enthusiasts, in 1927, established an amateur rocket group called the Verein für Raumschiffahrt (VfR—"Society for Space Flight"). Oberth joined the group, and acted as something of a mentor to its members. In 1928 and 1929, Oberth worked in Berlin as scientific consultant on the first film ever to have scenes set in space, Frau im Mond ("The Woman in the Moon"), directed at Universum Film AG by Fritz Lang. The film was of enormous value in popularizing the idea of rocket science. Oberth's main task was to build and launch a rocket as a publicity event prior to the film's premiere. He was, however, unable to complete more than a movie prop, and the payment negotiated by Lang for the actual missile launch was not forthcoming, leaving Oberth in a state of depression. But the film benefited immensely from the scientific imprimatur granted by its association with Oberth. Coinciding roughly with the film's 1929 premier, Oberth published a book-length work entitled Wege zur Raumschiffahrt (Ways to Spaceflight), which was an expansion of his 1923 thesis. As a result, Oberth won the first REP-Hirsch Prize of the French Astronomical Society for his encouragement of astronautics. In autumn 1929, Oberth tested his first liquid fuel engine. He was helped in this experiment by his students at the Technical University of Berlin, one of whom was Wernher von Braun, who would later head Germany's wartime effort to create a ballistic missile. He conducted further engine tests in 1930. For several years in the 1930s, Oberth taught physics and mathematics at the Stephan Ludwig Roth High School in Mediaş, all the while remaining active in the VfR. 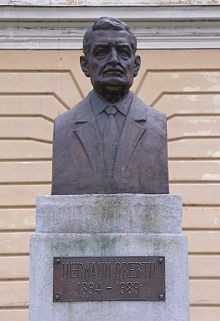 In 1938, the Oberth family left Sibiu for good, to settle in Germany, where he received a stipend from the University of Dresden for rocket research. In 1941, at the invitation of Von Braun, Oberth went to Peenemünde to work on the V-2, a weaponized rocket that was mass-produced toward the end of World War II, and used to much psychological effect on London. He was awarded the Kriegsverdienstkreuz I Klasse mit Schwertern (War Merit Cross 1st Class, with Swords) in 1943, for his "outstanding, courageous behavior … during the attack" of Peenemünde by Operation Hydra, the allied program to uncover and destroy Germany's ballistic missile capability. Oberth later worked on solid-propellant anti-aircraft rockets. At the end of the war, Oberth was detained, and then released, by Allied forces. Rather than joining the teams of German scientists that had been gathered together by both the United States and the Soviet Union after the war, he and his family moved to Feucht, near Nuremberg. Oberth left for Switzerland in 1948, where he worked as an independent consultant and a writer. In 1950, Oberth went on to Italy, where he completed work he had begun earlier for the Italian Navy. In 1953 he returned to Feucht to publish his book Menschen im Weltraum (Man in Space), in which he described his ideas for a space-based reflecting telescope, a space station, an electric spaceship, and space suits. In the 1950s, Oberth offered his opinions regarding unidentified flying objects; he was a supporter of the extraterrestrial hypothesis. Oberth eventually came to work for his ex-student von Braun, developing space rockets in Huntsville, Alabama, in the United States, from 1955 to 1959. Among other things, Oberth was involved in writing a study, The Development of Space Technology in the Next Ten Years. After his work at Huntsville, he went to Feucht, Germany, where he published his ideas on a lunar exploration vehicle, a "lunar catapult," and on "muffled" helicopters and airplanes. In 1960, in the United States again, he went to work for Convair as a technical consultant on the Atlas rocket. Hermann Oberth retired in 1962, at the age of 68. From 1965 to 1967, he was a member of the far right National Democratic Party. In July 1969, he returned to the United States to witness the launch of the Saturn V rocket that carried the Apollo 11 crew on the first landing mission to the Moon. The 1973 energy crisis inspired Oberth to look at alternative energy sources, including a plan for a wind power station that could utilize the jet stream. However, his main interest in retirement was to turn to more abstract philosophical questions. Most notable among his several books from this period is Primer For Those Who Would Govern. Oberth died in Nuremberg, on December 28, 1989. Oberth's accomplishments were more conceptual than actual. It was his early writing on the subject of rocketry that sparked the imagination of a generation of Germans who eventually developed the V-2 program. Their achievements ironically established the foundation for the U.S. space program, and led to the fulfillment of Oberth's dream—a manned flight to the Moon. Oberth is memorialized by the Hermann Oberth Space Travel Museum in Feucht, and by the Hermann Oberth Society, which brings together scientists, researchers, and astronauts from East and West to carry on his work in rocketry and space exploration. ↑ Le Monde, Mort de Hermann Oberth, Pionnier de la conquête spatiale (The Death of Hermann Oberth, Space Conquest Pioneer). 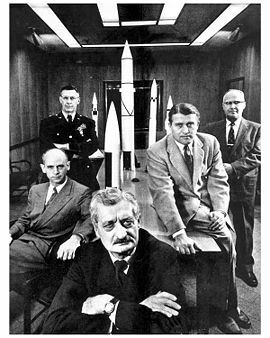 ↑ Kiosek.com, Hermann Oberth, Father of Space Travel. Retrieved October 9, 2007. ↑ L. Blosset, L'Aerophile, Smithsonian Annals of Flight. 10:11. ↑ U.S. Centennial of Flight Commission, Hermann Oberth. Retrieved October 9, 2007. Walters, Helen B. 1962. Hermann Oberth: Father of Space Travel. New York: Macmillan. The Hermann Oberth Raumfahrt Museum. This page was last modified on 21 December 2017, at 15:28.